Atlanta, GA., January 01, 2013, 2:41 am -- /EPR NETWORK/ -- Urban or gospel theater, commonly referred to as “The Chitlin’ Circuit”, is a joke in most professional circles, mainly because its basis is of an inner city experience and its writers have no formal training. But many urban theater playwrights are laughing all the way to the bank! Every weekend throughout the country, from small church houses to large arenas, you can find a rabble rousing gospel or urban play filled with adoring fans. The popularity of this art form has soared in the wake of the Tyler Perry era, an urban playwright who is now a major Hollywood mogul. There is no doubt, urban theater and film is in high demand from major retailers. The critical issue is that the average urban playwright often has a great message,but lacks the information or tools to produce a professional production. Having experienced this firsthand, Lynn, who in 1995 wrote her first play “Unequally Yoked”, was met with much resistance and little support. A single working mother at the time, she had no one to turn to for assistance to get her play produced professionally. It was not until 2006, after losing a corporate job that she was inspired to revisit her 1995 play and launch into the deep. Her experience and the lack of information available about this little known genre of theater prompted Lynn to start Urban Playwrights United, a nationwide networking group of playwrights that exchange information and ideas, which eventually lead to a national conference that convenes annually. But with many playwrights not able to travel, Lynn decided to put her personal experiences, mishaps and successes in book form so that playwrights would have a practical hands-on guide that deals with the specifics of producing a quality play in the urban theater genre. 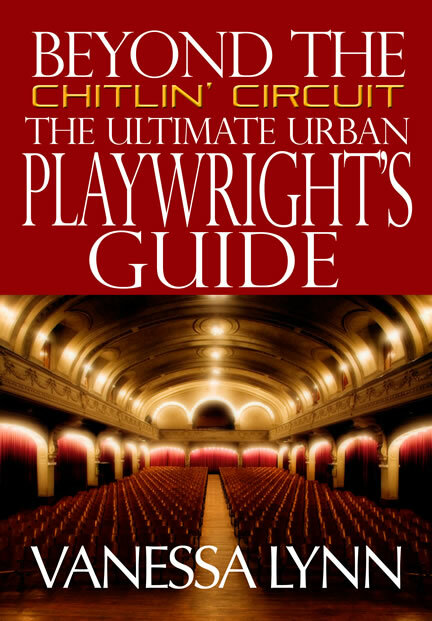 Beyond the Chitlin’ Circuit, The Ultimate Urban Playwrights Guide is the first published resource of its kind and covers topics from the creative process of writing a play to DVD production and distribution, including Lynn’s personal journeys and struggles. “While producing my plays in the earlier times, I would say, “I wish someone would have told me…’” With this thought, included in the book are many “what not to do” scenarios that Lynn has gathered through her years of mentoring playwrights. About the Author: Vanessa Lynn is a nationally published playwright with a distribution deal for her plays Affairs and Unequally Yoked,and upcoming DVD Boss Lady. Lynn was also a contributing writer on the touring stage play, Church Girl, which can now be seen on BET. Lynn recently relocated to Atlanta, GA from her birthplace of Detroit, MI, and is the proud mother of two adult daughters and a young grandson. Beyond the Chitlin’ Circuit officially released on March 1, 2013 and a book launch and seminar will be held at the Professional Actors Studio (2849 Piedmont N.E.) in Atlanta, GA at 12:30 p.m. on March 2, 2013. For more information or interviews, please visit: www.playwrightsbook.com, e-mail info@playwrightsbook.com, or call: 313-649-5001.